Signode Industrial Group, a leading manufacturer of a broad spectrum of packaging consumables, tools, software and equipment to optimize load containment, will display a wide variety of its customer-focused innovations at FABTECH in Atlanta, Georgia at booth #A2833. With 88 manufacturing facilities across six continents, the company does business under more than two dozen highly respected brands throughout the world. 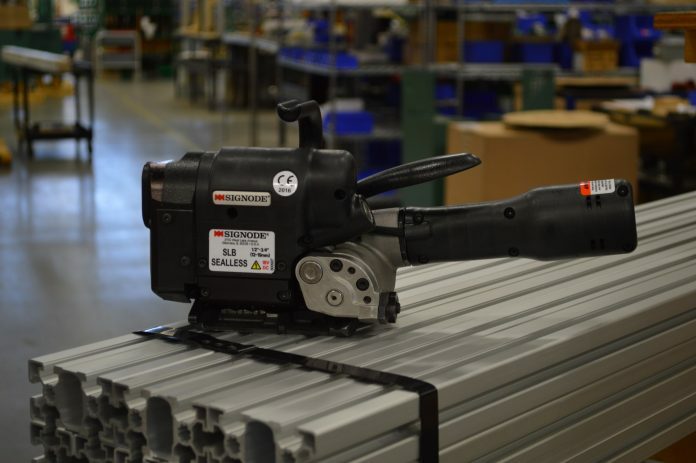 Among the offerings available to Signode customers, Signode Industrial Group is proud to showcase the world’s first battery powered combination tool for steel strapping, the GripPack SLB at FABTECH. The GripPack SLB is designed without air hoses or compressors therefore creating more portability and producing less noise. The user can easily tension, seal and cut with a single button. The seal-less joint eliminates the need for metal seals and the entire tool is light-weight and durable. A quick-charge 18 volt lithium ion battery provides ease of use and long-lasting battery life. The tool is manufactured with proven and trusted Signode components and is lower maintenance when compared to pneumatic tools. Engineered with fewer moving parts, the tool provides more consistency and accuracy of strap applied tension levels. The innovative GripPack Mobile Application utilizes Bluetooth ® technology to communicate with the tool and sends proactive maintenance reminders to the user. The application also monitors wear parts and can access cycle count and battery life status. Signode’s latest BXT-3 series tool will also be on display. This next generation of battery-powered combination tools for plastic strapping is designed with industry-first features which set the standard for battery operated strapping tools. The BXT-3 features an easy to use “favorite strapping function” so operators can quickly save settings for recurring package goods. This easy-to-use feature helps ensure consistent results from operator to operator and from shift to shift, increasing process reliability. The real time tension force indicator displays tension force in real-time allowing operators to maintain proper tension consistently, a key to load integrity. 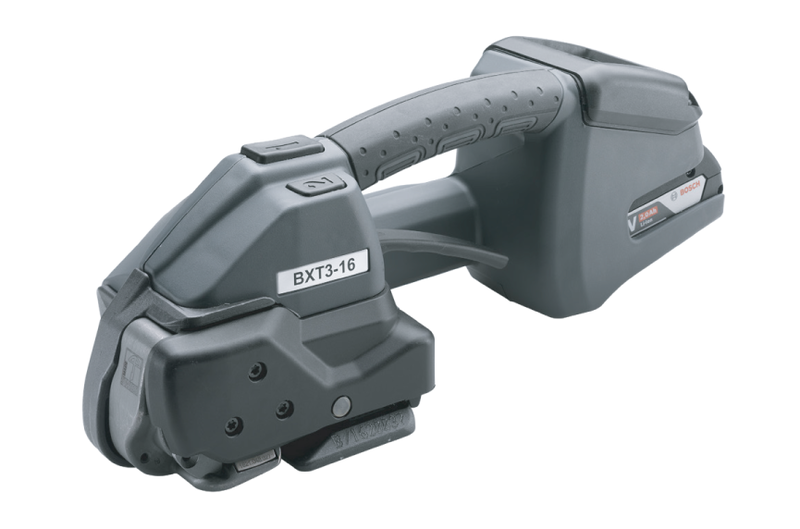 Designed for easy use, the BXT-3 gives operators more control of the tension force with the use of just one finger on a button. The strap alignment indicator feature which warns of misaligned straps, contributes to load safety and reduces operator errors. The BXT-3 offers the first full touch display system on a battery-operated strapping tool. Featuring an easy to navigate full touch display, the BXT-3 series also offers strap alignment indication, while the 3-color display & acoustic signal for tool status helps avoid malfunctions during the tensioning, welding, and cutting process with easy to understand signals. The BXT-3 also allows for operators to switch between automatic, semi-automatic, and manual settings, and lock the entire screen. The tool is designed for light to heavy duty applications, ranging from a low-tension force of 33-270 lb. to high-tension force of 90-1000 lb. Signode will also be showcasing its Yellow Jacket Orbital Stretch Wrapper. Originally built by fabricators to solve the unique challenges of securing oddly shaped, heavy loads directly to the pallet, Muller’s Yellow Jacket orbital stretch wrapper is the preferred load containment solution for fabricating industry veterans. The Yellow Jacket effectively secures complex fabrications, metal parts and loose assemblies on a pallet while simultaneously minimizing the time and labor traditionally required to secure the load to a pallet. Yellow Jacket’s Orbital Stretch Wrapper is available in manual or semi-automatic. The 87M requires a footprint of only about 8’x9’ and runs on 110VAC- making it easy to install in any environment. It also wraps a standard pallet size up to 68” diagonal. and Metalworking industry show. 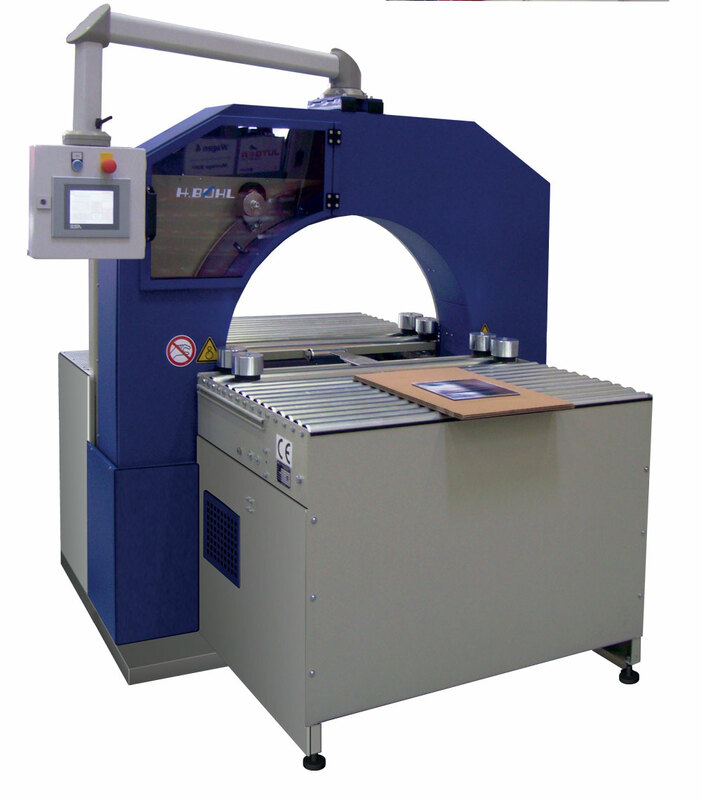 This fully-automatic wrapping machine with modular design and an automatic product height detection system adjustable to varying product sizes, is ideal for a large range of products and profiles, offering optimum protection of goods. 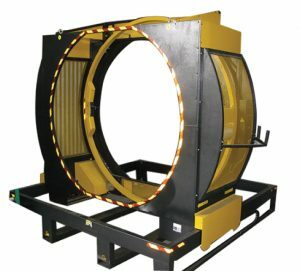 The machine can easily be integrated in production lines and can be delivered with motor driven entry area and a pinch compression roller in the entry area. The BSB-450 VA allows for divergent products to be packed in bundles or be entirely wrapped to convenience, reducing the risk of product damage. Requiring low cost consumables and energy and minimal set-up time, the machine operates at low noise level and it is PLC controlled by an HMI touch panel. Signode Industrial Group is a $2.4 billion leading global manufacturer of strap, stretch, and protective packaging consumables, tools and equipment. The company’s products protect goods during manufacturing, transport and warehousing. In some of the company’s core consumable products, recycled materials are a primary feedstock. The company’s history dates back to 1913 when the Seal and Fastener Company opened in Chicago. Today, the company sells products under a broad group of well-known brands and businesses, including Acme Packaging, Angleboard, Fleetwood, Haloila, Kiwiplan, Mima, Muller, Multi-Wall, Orgapack, Shippers Products, Signode and Strapex.